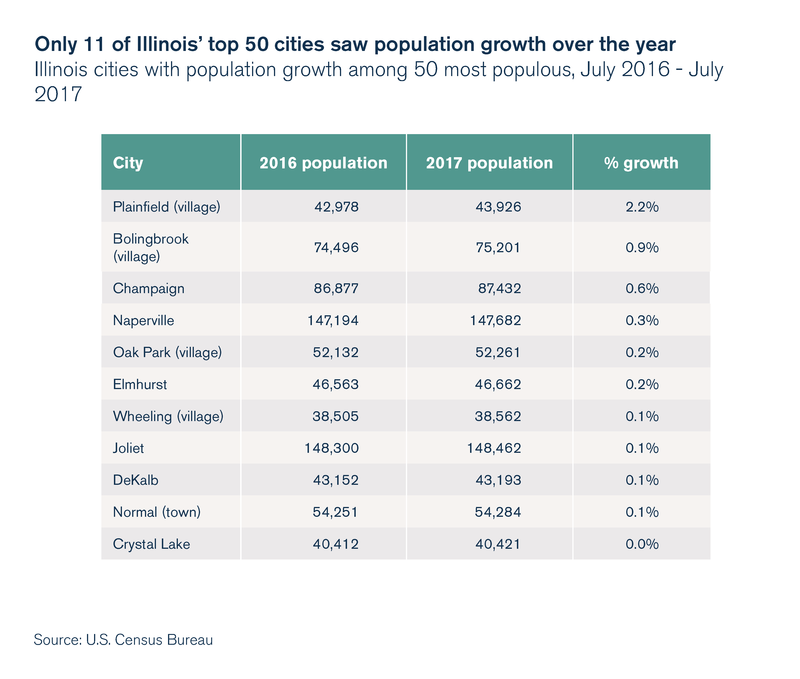 Nearly 80 percent of Illinois’ most populous cities saw population decline from July 2016 to July 2017, according to new data from the U.S. Census Bureau released May 24. 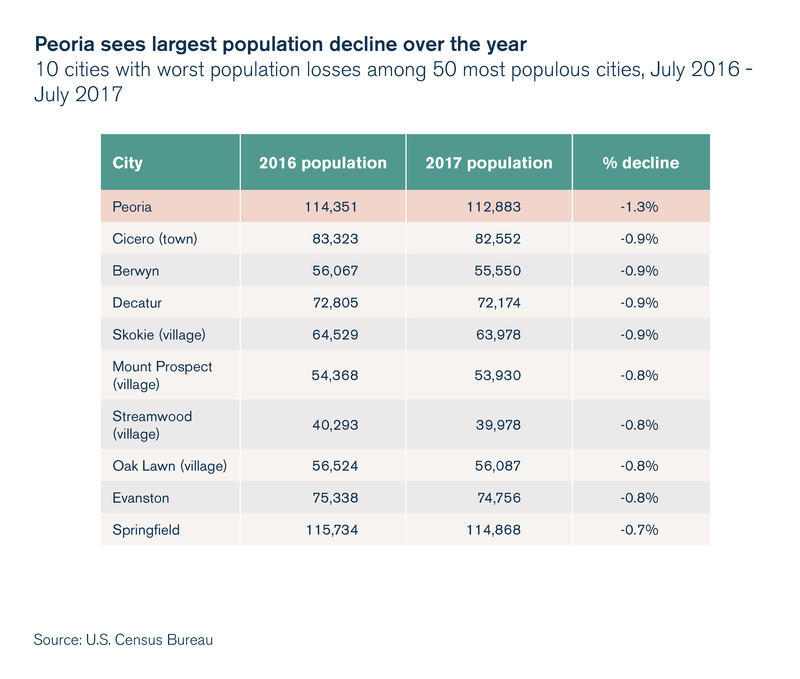 Of the state’s top 50 cities, 39 saw a shrinking population over the year, while 25 have seen their populations shrink compared with 2010. These trends align with Illinois’ statewide problem of population loss, which has been occurring for the last four years consecutively – driven by a loss of people to other states. Only West Virginia has seen more consecutive years of population decline. Meanwhile, none of Illinois’ neighboring states have experienced population decline since 2011. By and large, Illinois’ most populous cities did not have a good year for growth. Chicago shed population for the third year running, losing more than 3,800 people. 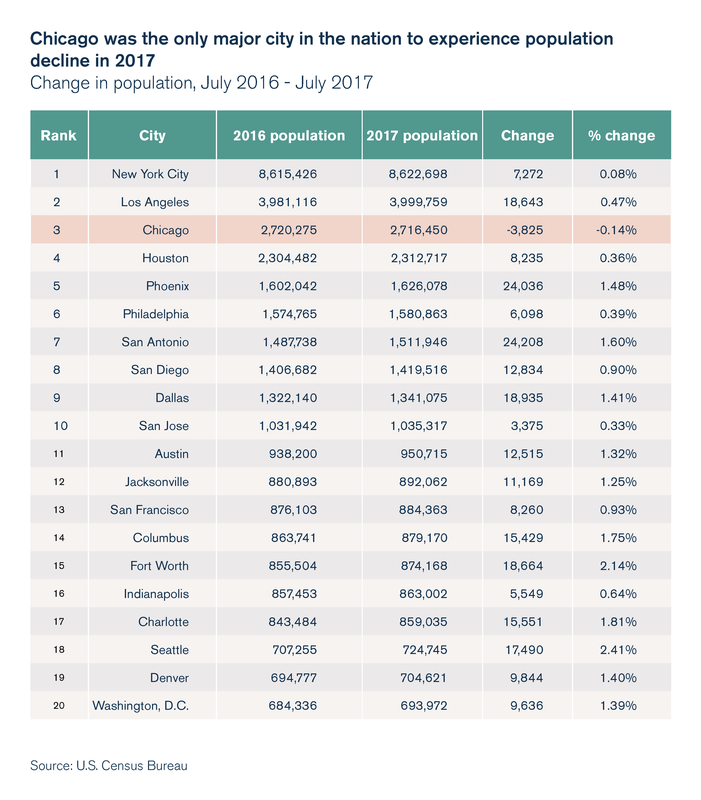 Among the top 20 cities in the U.S., it was the only one to lose residents over the year. 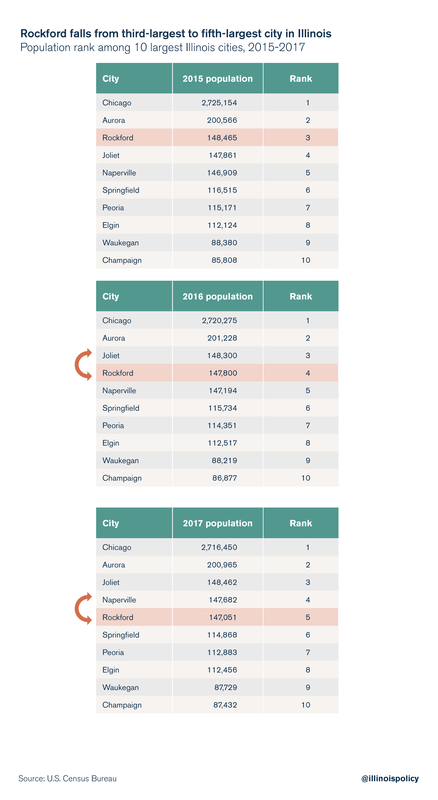 Years of population loss in Rockford have caused it to fall behind Naperville as the fourth-largest city in Illinois, behind Joliet, Aurora and Chicago. In raw terms, Rockford has seen the most severe population losses in the state since 2010, losing more than 6,100 people, or 4 percent of its population. Peoria suffered the steepest decline among the 50 largest cities in Illinois over the year, losing nearly 1,500 people for a decline of 1.3 percent. One of the city’s largest employers, Caterpillar Inc., announced plans in January 2017 to move its global headquarters out of Peoria to the Chicago suburbs. On the other end of the spectrum was the Will County village of Plainfield, which grew by more than 2 percent over the year and has grown 10 percent since 2010. But taken together, the 11 cities among the top 50 that saw population growth accounted for a meager increase of 3,200 people. Decatur retained the title of the fastest-shrinking Illinois city home to more than 50,000 people. The Soy City has lost nearly 4,000 people since 2010, or 5.2 percent of its population. The area has been hammered by manufacturing jobs losses as well as a high-tax environment. 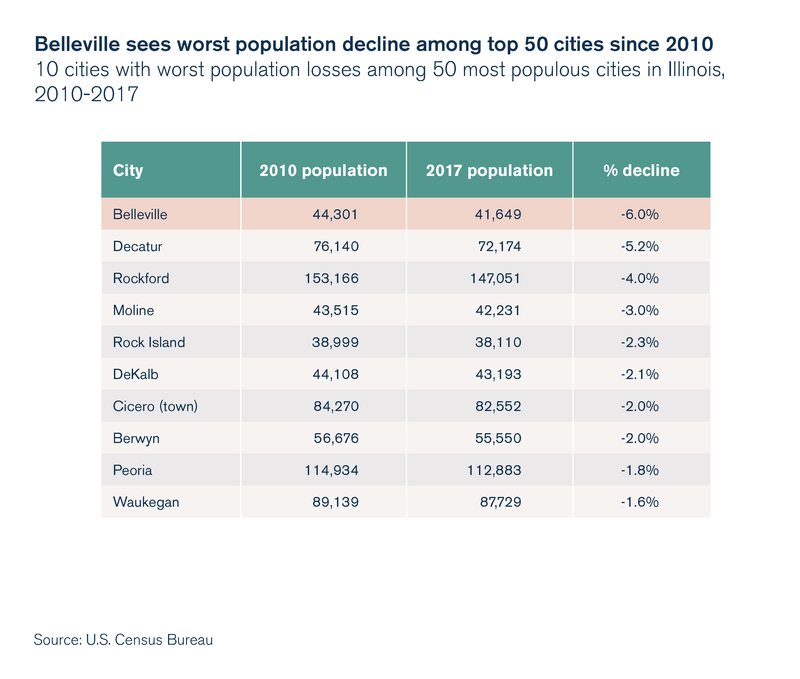 Among the top 50 most populous cities in Illinois (the smallest of which is home to 37,500 people), only one city has seen heavier losses than Decatur: Belleville. Since 2010, the downstate border city has lost more than 2,600 residents, or 6 percent of its population. Beyond Belleville, other cities in the Metro East region have seen heavy population losses as well, including Alton (-1,200 population since 2010, a 4.2 percent decline), Granite City (-1,100, -3.7 percent) and Collinsville (-800, -3.3 percent). O’Fallon and Edwardsville each gained about 600 residents since 2010, while East St. Louis lost about 200 residents. In sharp contrast with Illinois, Texas is seeing some of the nation’s fastest population growth in its larger cities. Over the year, three of the top five large U.S. cities in terms of raw population gains were in Texas: San Antonio, Dallas and Fort Worth. In percentage terms, Texas was home to seven of the top 15 big cities with the largest population gains. Especially for Illinoisans earning higher than average income, Texas is a top moving destination, according to data from the IRS. In addition to population gains, the Lone Star State has also experienced healthy economic growth. Years of anti-growth economic policies in Springfield have lead to a dearth of economic opportunity in Illinois. 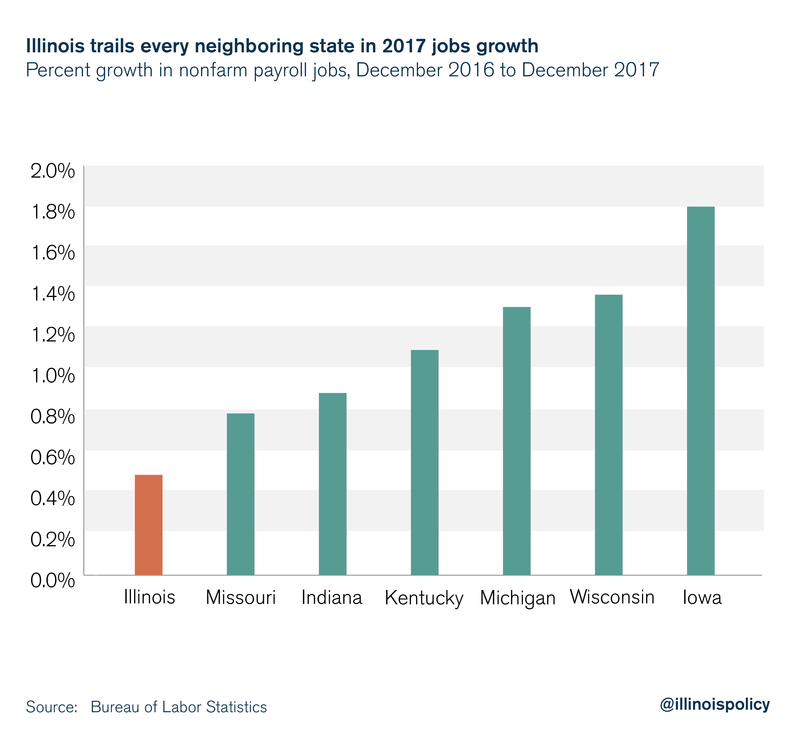 Illinois’ jobs growth was 42nd out of 50 states in 2017 and last among all its neighbors. Reducing cost drivers for businesses and creating a better environment for new investment must be a part of any serious plan to flip Illinois’ current trend. When people can’t find good job opportunities in the Land of Lincoln, they are too often forced to leave. And to take their place, too few have enough confidence in the state to move in from elsewhere and build a future. As state lawmakers yet again rush to pass a budget, one way to bring more certainty to Illinoisans in shrinking communities would be to adopt a state spending cap – assuring families and businesses that they won’t be subjected to continuous tax hikes to make up for unbalanced budgets. Growing Illinois requires growing confidence. That means spending restraint, aggressive reform and renewed respect for taxpayers.